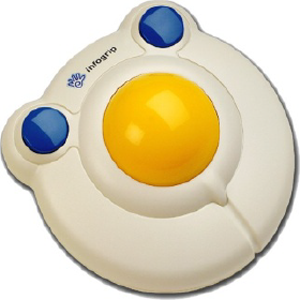 The BIGtrack has a 3 inch trackball which makes it the largest trackball available.The BIGtrack is a valuable tool for users who lack fine motor skills which a regular mouse requires. For example, if you have arthritis an ordinary mouse can be difficult to hold and keep the cursor in position whilst you click. The BIGtrack allows you to settle the cursor in position and then click easily without moving the cursor inadvertently. It has a left and a right mouse click button located behind the trackball to avoid unwanted mouse clicks. The BIGtrack also allows for 2nd Mouse Connection both the BIGtrack and a second mouse can be connected allowing simultaneous participation. For even more access the BIGtrack is available in a switch adapted version. The switch adapted BIGtrack comes with two standard 1/8″ plugs for two switches. Its left and right mouse clicks have been adapted so that you can use a switch for activation.